Everyone has a unique smell. A child can sense their mother’s smell and be comforted by it, even if Mom isn’t present. I have been known to take a deep breath as I hug my kids to drink in their scent. There is a powerful connection between smell and memory, one from which we all can benefit. 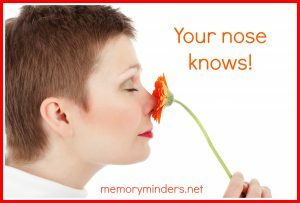 In our MemoryMinders groups, we often do a smell test as we discuss the importance of smell and memory. It’s amazing the memories revived by a simple smell. Cinnamon takes us back to Grandma’s kitchen and grass to a lazy summer day. Our sense of smell (or lack thereof) is also becoming a strong bellwether indicator of future memory issues. More studies I’m sure are coming on this in the future. So it was only a matter of time before someone studied how to use our sense in identifying unique smells of individuals. In a recent study, experimental psychologists tested how well humans could identify criminals by their unique body odor. Our olfactory sense is often associated with emotional processing and is directly linked to the brain areas associated with emotion and memory; the hippocampus and the amygdala. So using the identifying nature of someone’s unique smell, especially in emotional situations, could be very useful. They set up an experiment associating human body odor with emotional events (violent crimes) as well as neutral events. Participants identified the correct body odor in almost 70% of the cases, with the emotional events demonstrating even better recall. They also identified that the smell memory lessened with time and increased choices. This information is useful and can be used to further assist in crime investigations, especially those where other senses especially vision are compromised. But it also confirms what all of us who work in the memory field already knew: the nose knows! Pay attention to all the smells around you. Not only will it assist you to enjoy your life by enhancing your memory of people and the world, but could also help you catch a criminal! Interested in sharpening your mental awareness? Check out our new service MemoryMinders Academy! It’s a great way to engage your brain with mental fitness exercises each week as well as extra strategies and memory tips. This would be a great gift for Father’s Day! Click on the MemoryMinders Academy webpage for details or contact me with any questions!